Regulation (EC) No 715/2007 requires the Commission to keep under review the procedures, tests and requirements for type-approval that are set out in Commission Regulation (EC) No 692/2008 (2) and to adjust them so that they adequately reflect the emissions generated by real driving on the road, if necessary. The Commission has performed a detailed analysis in this respect on the basis of own research and external information and found that emissions generated by real driving on the road of Euro 5/6 vehicles substantially exceed the emissions measured on the regulatory new European driving cycle (NEDC), in particular with respect to NOx emissions of diesel vehicles. Type-approval emission requirements for motor vehicles have been tightened significantly through the introduction and subsequent revision of Euro standards. While vehicles in general have delivered substantial emission reductions across the range of regulated pollutants, this is not true of NOx emissions from diesel engines (especially light-duty vehicles). Actions for correcting this situation are therefore needed. Addressing the problem of NOx emissions from diesel engines should contribute to decrease the current sustained high levels of NO2 concentrations in ambient air, which are particularly related to those emissions and are a major concern regarding human health, as well as a challenge regarding compliance with Directive 2008/50/EC of the European Parliament and of the Council (3). The Commission has established in January 2011 a working group involving all interested stakeholders for developing a real driving emission (RDE) test procedure better reflecting emissions measured on the road. For this purpose the technical option suggested in Regulation (EC) No 715/2007, i.e. the use of portable emission measurement systems (PEMS) and not-to-exceed (NTE) regulatory concepts has been followed. In order to allow manufacturers gradually to adapt to the RDE requirements, the respective test procedures should be introduced in two phases as agreed with stakeholders in the Cars 2020 process (4): during a first transitional period the test procedures should only be applied for monitoring purposes, while afterwards they should be applied together with binding quantitative RDE requirements to all new type-approvals/new vehicles. The final quantitative RDE requirements will be introduced in two subsequent steps. Quantitative RDE requirements should be established in order to limit tailpipe emissions under all normal conditions of use pursuant to the emission limits set out in Regulation (EC) No 715/2007. For that purpose statistical and technical uncertainties of the measurement procedures should be taken into account. An individual RDE test at the initial type-approval cannot cover the full range of relevant traffic and ambient conditions. Therefore in-service-conformity testing is of utmost importance for ensuring that a widest possible range of such conditions is covered by a regulatory RDE test, thereby providing for compliance with the regulatory requirements under all normal conditions of use. For small-volume manufacturers the execution of PEMS tests according to the envisaged procedural requirements may constitute a significant burden that is not in balance with the expected environmental benefit. It is therefore appropriate to allow for some specific exemptions for those manufacturers. Real driving emissions test procedure should be updated and improved if necessary to reflect, e.g., changes in vehicle technology. To assist the revision procedure, vehicle and emissions data obtained during the transitional period should be considered. In order to allow approval authorities and manufacturers to put in place the necessary procedures to comply with the requirements of this Regulation, it should apply from 1 January 2016. “Portable emissions measurement system (PEMS)” means a portable emissions measurement system meeting the requirements specified in Appendix 1 to Annex IIIA;’. ‘10. The manufacturer shall ensure that, throughout the normal life of a vehicle which is type-approved in accordance with Regulation (EC) No 715/2007, its emissions as determined in accordance with the requirements set out in Annex IIIA to this Regulation and emitted at an RDE test performed in accordance with that Annex, shall not exceed the values set out therein. The requirements of point 2.1 of Annex IIIA to this Regulation shall only apply after the adoption of specific values for the parameters CFpollutant in the table of point 2.1 of Annex IIIA to this Regulation. The other requirements of Annex IIIA, in particular with regard to RDE tests to be performed and data to be recorded and made available, shall apply only to new type-approvals according to Regulation (EC) No 715/2007 issued after the twentieth day following that of the publication of Annex IIIA in the Official Journal of the European Union. The requirements of Annex IIIA shall not apply to type-approvals granted to small-volume manufacturers as defined in Article 2(32) of this Regulation. where those requirements are again satisfied for only one method the analysis of the completeness and normality shall be recorded for both methods and the calculation required by point 9.3 of Annex IIIA may be limited to the method for which the completeness and normality requirements are satisfied. The power at the wheels of the test vehicle shall be determined either by wheel hub torque measurement or from the CO2 mass flow using “Velines” according to point 4 of Appendix 6 of Annex IIIA.’. for vehicles type-approved to the requirements of the Euro 6 emission limits given in Table 2 of Annex I of Regulation (EC) No 715/2007, the vehicle has been approved according to UN/ECE Regulations No 83, series of amendments 07, No 85 and its supplements, No 101, Revision 3 (comprising series of amendments 01 and their supplements) and in the case of compression ignition vehicles No 24 Part III, series of amendments 03.’. The particulate number RDE test only applies to vehicles for which Euro 6 PN emission limits are defined in Table 2 of Annex I to Regulation (EC) No 715/2007.’. A new Annex IIIA is inserted as set out in the Annex to this Regulation. It shall apply from 1 January 2016. Done at Brussels, 10 March 2016. (2) Commission Regulation (EC) No 692/2008 of 18 July 2008 implementing and amending Regulation (EC) No 715/2007 of the European Parliament and of the Council on type-approval of motor vehicles with respect to emissions from light passenger and commercial vehicles (Euro 5 and Euro 6) and on access to vehicle repair and maintenance information (OJ L 199, 28.7.2008, p. 1). (3) Directive 2008/50/EC of the European Parliament and of the Council of 21 May 2008 on ambient air quality and cleaner air for Europe (OJ L 152, 11.6.2008, p. 1). (4) Communication from the Commission to the European Parliament, the Council, the European Economic and Social Committee and the Committee of the Regions: Cars 2020: Action Plan for a competitive and sustainable automotive industry in Europe (COM(2012) 636 final). This Annex describes the procedure to verify the Real Driving Emissions (RDE) performance of light passenger and commercial vehicles. 1.2.1. “Accuracy” means the deviation between a measured or calculated value and a traceable reference value. 1.2.2. “Analyser” means any measurement device that is not part of the vehicle but installed to determine the concentration or the amount of gaseous or particle pollutants. is the mean value of the parameter to be verified. 1.2.4. “Calibration” means the process of setting the response of an analyser, flow-measuring instrument, sensor, or signal so that its output agrees with one or multiple reference signals. 1.2.7. “Delay time” means the time from the gas flow switching (t0) until the response reaches 10 per cent (t10) of the final reading. 1.2.8. “Engine control unit (ECU) signals or data” means any vehicle information and signal recorded from the vehicle network using the protocols specified in point 3.4.5.of Appendix 1. 1.2.9. “Engine control unit” means the electronic unit that controls various actuators to ensure the optimal performance of the powertrain. 1.2.10. “Emissions” also referred to as “components”, “pollutant components” or “pollutant emissions” means the regulated gaseous or particle constituents of the exhaust. 1.2.11. “Exhaust”, also referred to as exhaust gas, means the total of all gaseous and particulate components emitted at the exhaust outlet or tailpipe as the result of fuel combustion within the vehicle's internal combustion engine. 1.2.12. “Exhaust emissions” means the emissions of particles, characterised as particulate matter and particle number, and of gaseous components at the tailpipe of a vehicle. 1.2.13. “Full scale” means the full range of an analyser, flow-measuring instrument or sensor as specified by the equipment manufacturer. If a sub-range of the analyser, flow-measuring instrument or sensor is used for measurements, full scale shall be understood as the maximum reading. 1.2.14. “Hydrocarbon response factor” of a particular hydrocarbon species means the ratio between the reading of a FID and the concentration of the hydrocarbon species under consideration in the reference gas cylinder, expressed as ppmC1. 1.2.15. “Major maintenance” means the adjustment, repair or replacement of an analyser, flow-measuring instrument or sensor that could affect the accuracy of measurements. 1.2.16. “Noise” means two times the root mean square of ten standard deviations, each calculated from the zero responses measured at a constant recording frequency of at least 1,0 Hz during a period of 30 seconds. 1.2.17. “Non-methane hydrocarbons” (NMHC) means the total hydrocarbons (THC) excluding methane (CH4). 1.2.18. “Particle number” (PN) means as the total number of solid particles emitted from the vehicle exhaust as defined by the measurement procedure provided for by this Regulation for assessing the respective Euro 6 emission limit defined in Table 2 of Annex I to Regulation (EC) No 715/2007. 1.2.19. “Precision” means 2,5 times the standard deviation of 10 repetitive responses to a given traceable standard value. 1.2.20. “Reading” means the numerical value displayed by an analyser, flow-measuring instrument, sensor or any other measurement devise applied in the context of vehicle emission measurements. 1.2.21. “Response time” (t 90) means the sum of the delay time and the rise time. 1.2.22. “Rise time” means the time between the 10 per cent and 90 per cent response (t90 – t10) of the final reading. 1.2.24. “Sensor” means any measurement device that is not part of the vehicle itself but installed to determine parameters other than the concentration of gaseous and particle pollutants and the exhaust mass flow. 1.2.25. “Span” means the calibration of an analyser, flow-measuring instrument, or sensor so that it gives an accurate response to a standard that matches as closely as possible the maximum value expected to occur during the actual emissions test. 1.2.26. “Span response” means the mean response to a span signal over a time interval of at least 30 seconds. 1.2.27. “Span response drift” means the difference between the mean response to a span signal and the actual span signal that is measured at a defined time period after an analyser, flow-measuring instrument or sensor was accurately spanned. 1.2.30. “Total hydrocarbons” (THC) means the sum of all volatile compounds measurable by a flame ionisation detector (FID). 1.2.31. “Traceable” means the ability to relate a measurement or reading through an unbroken chain of comparisons to a known and commonly agreed standard. 1.2.32. “Transformation time” means the time difference between a change of concentration or flow (t 0) at the reference point and a system response of 50 per cent of the final reading (t 50). 1.2.33. “Type of analyser”, also referred to as “analyser type” means a group of analysers produced by the same manufacturer that apply an identical principle to determine the concentration of one specific gaseous component or the number of particles. 1.2.34. “Type of exhaust mass flow meter” means a group of exhaust mass flow meters produced by the same manufacturer that share a similar tube inner diameter and function on an identical principle to determine the mass flow rate of the exhaust gas. 1.2.35. “Validation” means the process of evaluating the correct installation and functionality of a Portable Emissions Measurement System and the correctness of exhaust mass flow rate measurements as obtained from one or multiple non-traceable exhaust mass flow meters or as calculated from sensors or ECU signals. 1.2.36. “Verification” means the process of evaluating whether the measured or calculated output of an analyser, flow-measuring instrument, sensor or signal agrees with a reference signal within one or more predetermined thresholds for acceptance. 1.2.37. “Zero” means the calibration of an analyser, flow-measuring instrument or sensor so that it gives an accurate response to a zero signal. 1.2.38. “Zero response” means the mean response to a zero signal over a time interval of at least 30 seconds. 1.2.39. “Zero response drift” means the difference between the mean response to a zero signal and the actual zero signal that is measured over a defined time period after an analyser, flow-measuring instrument or sensor has been accurately zero calibrated. Abbreviations refer generically to both the singular and the plural forms of abbreviated terms. 2.2. The manufacturer shall confirm compliance with point 2.1 by completing the certificate set out in Appendix 9. 2.3. The RDE tests required by this Annex at type-approval and during the lifetime of a vehicle provide a presumption of conformity with the requirement set out in point 2.1. The presumed conformity may be reassessed by additional RDE tests. 2.4. Member States shall ensure that vehicles can be tested with PEMS on public roads in accordance with the procedures under their own national law, while respecting local road traffic legislation and safety requirements. 2.5. Manufacturers shall ensure that vehicles can be tested with PEMS by an independent party on public roads fulfilling the requirements of point 2.4, e.g. by making available suitable adapters for exhaust pipes, granting access to ECU signals and making the necessary administrative arrangements. If the respective PEMS test is not required by this Regulation the manufacturer may charge a reasonable fee as set out in Article 7(1) of Regulation (EC) No 715/2007. 3.1. The following requirements apply to PEMS tests referred to in Article 3(10), second sub-paragraph. 3.1.1. For type-approval, the exhaust mass flow shall be determined by measurement equipment functioning independently from the vehicle and no vehicle ECU data shall be used in this respect. Outside the type-approval context, alternative methods to determine the exhaust mass flow can be used according to Appendix 2, Section 7.2. 3.1.2. If the approval authority is not satisfied with the data quality check and validation results of a PEMS test conducted according to Appendices 1 and 4, the approval authority may consider the test to be void. In such case, the test data and the reasons for voiding the test shall be recorded by the approval authority. 3.1.3.1. A technical report prepared by the manufacturer in accordance with Appendix 8 shall be made available to the approval authority. the results of the PEMS tests as set out in points 6.3 of Appendix 5 and 3.9 of Appendix 6 for all vehicle emission types in the list described in point 5.4 of Appendix 7. 3.1.3.3. Upon request, without costs and within 30 days, the manufacturer shall make available the technical report referred to in point 3.1.3.1 to any interested party. 3.1.3.4. Upon request, the type-approval authority shall make available the information listed under points 3.1.3.1 and 3.1.3.2 within 30 days of receiving the request. The type-approval authority may charge a reasonable and proportionate fee, which does not discourage an inquirer with a justified interest from requesting the respective information or exceed the internal costs of the authority for making the requested information available. 4.1. The RDE performance shall be demonstrated by testing vehicles on the road operated over their normal driving patterns, conditions and payloads. The RDE test shall be representative for vehicles operated on their real driving routes, with their normal load. 4.2. The manufacturer shall demonstrate to the approval authority that the chosen vehicle, driving patterns, conditions and payloads are representative for the vehicle family. The payload and altitude requirements, as specified in points 5.1 and 5.2, shall be used ex-ante to determine whether the conditions are acceptable for RDE testing. 4.3. The approval authority shall propose a test trip in urban, rural and motorway environments meeting the requirements of point 6. For the purpose of trip selection, the definition of urban, rural and motorway operation shall be based on a topographic map. 4.4. If for a vehicle the collection of ECU data influences the vehicle's emissions or performance the entire PEMS test family to which the vehicle belongs as defined in Appendix 7 shall be considered as non-compliant. Such functionality shall be considered as a “defeat device” as defined in Article 3(10) of Regulation (EC) No 715/2007. 5.1.1. The vehicle's basic payload shall comprise the driver, a witness of the test (if applicable) and the test equipment, including the mounting and the power supply devices. 5.1.2. For the purpose of testing some artificial payload may be added as long as the total mass of the basic and artificial payload does not exceed 90 % of the sum of the “mass of the passengers” and the “pay-mass” defined in points 19 and 21 of Article 2 of Commission Regulation (EU) No 1230/2012 (2). 5.2.1. The test shall be conducted under ambient conditions laid down in this section. The ambient conditions become “extended” when at least one of the temperature and altitude conditions is extended. 5.2.2. Moderate altitude conditions: Altitude lower or equal to 700 metres above sea level. 5.2.3. Extended altitude conditions: Altitude higher than 700 metres above sea level and lower or equal to 1 300 metres above sea level. 5.2.6. By way of derogation from the provisions of points 5.2.4 and 5.2.5 the lower temperature for moderate conditions shall be greater or equal to 276K (3 °C) and the lower temperature for extended conditions shall be greater or equal to 271 K (– 2 °C) between the start of the application of binding NTE emission limits as defined in Section 2.1 and until five years after the dates given in paragraphs 4 and 5 of Article 10 of Regulation (EC) No 715/2007. 5.4. The dynamic conditions encompass the effect of road grade, head wind and driving dynamics (accelerations, decelerations) and auxiliary systems upon energy consumption and emissions of the test vehicle. The verification of the normality of dynamic conditions shall be done after the test is completed, using the recorded PEMS data. The methods for verifying the normality of the dynamic conditions, are laid down in Appendices 5 and 6 of this Annex. Each method includes a reference for dynamic conditions, ranges around the reference and the minimum coverage requirements to achieve a valid test. The air conditioning system or other auxiliary devices shall be operated in a way which corresponds to their possible use by a consumer at real driving on the road. 5.5.2.1. “Periodically regenerating systems” shall be understood according to the definition in Article 2(6). 5.5.2.2. If periodic regeneration occurs during a test, the test may be voided and repeated once at the request of the manufacturer. 5.5.2.3. The manufacturer may ensure the completion of the regeneration and precondition the vehicle appropriately prior to the second test. 5.5.2.4. If regeneration occurs during the repetition of the RDE test, pollutants emitted during the repeated test shall be included in the emissions evaluation. 6.1. 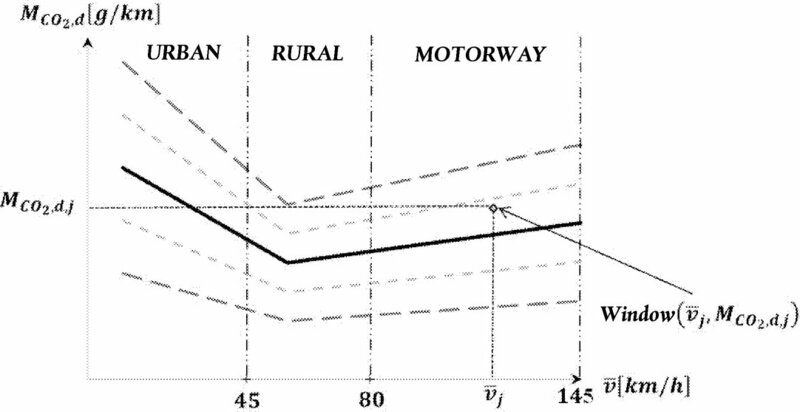 The shares of urban, rural and motorway driving, classified by instantaneous speed as described in points 6.3 to 6.5, shall be expressed as a percentage of the total trip distance. 6.2. The trip sequence shall consist of urban driving followed by rural and motorway driving according to the shares specified in point 6.6. The urban, rural and motorway operation shall be run continuously. Rural operation may be interrupted by short periods of urban operation when driving through urban areas. Motorway operation may be interrupted by short periods of urban or rural operation, e.g. when passing toll stations or sections of road work. If another testing order is justified for practical reasons, the order of urban, rural and motorway operation may be altered, after obtaining approval from the approval authority. 6.3. Urban operation is characterised by vehicle speeds up to 60 km/h. 6.4. Rural operation is characterised by vehicle speeds between 60 and 90 km/h. 6.5. Motorway operation is characterised by speeds above 90 km/h. 6.6. The trip shall consist of approximately 34 % per cent urban, 33 % per cent rural and 33 % per cent motorway operation classified by speed as described in points 6.3 to 6.5 above. “Approximately” shall mean the interval of ± 10 per cent points around the stated percentages. The urban operation shall however never be less than 29 % of the total trip distance. 6.7. The vehicle velocity shall normally not exceed 145 km/h. This maximum speed may be exceeded by a tolerance of 15 km/h for not more than 3 % of the time duration of the motorway driving. Local speed limits remain in force at a PEMS test, notwithstanding other legal consequences. Violations of local speed limits per se do not invalidate the results of a PEMS test. 6.8. The average speed (including stops) of the urban driving part of the trip should be between 15 and 30 km/h. Stop periods, defined as vehicle speed of less than 1 km/h, shall account for at least 10 % of the time duration of urban operation. Urban operation shall contain several stop periods of 10 s or longer. The inclusion of one excessively long stop period that individually comprises >80 % of the total stop time of urban operation shall be avoided. 6.9. The speed range of the motorway driving shall properly cover a range between 90 and at least 110 km/h. The vehicle's velocity shall be above 100 km/h for at least 5 minutes. 6.10. The trip duration shall be between 90 and 120 minutes. 6.11. The start and the end point shall not differ in their elevation above sea level by more than 100 m.
6.12. The minimum distance of each operation: urban, rural and motorway, shall be 16 km. 7.1. The trip shall be selected in such a way that the testing is uninterrupted and the data continuously recorded to reach the minimum test duration defined in point 6.10. 7.2. Electrical power shall be supplied to the PEMS by an external power supply unit and not from a source that draws its energy either directly or indirectly from the engine of the test vehicle. 7.3. The installation of the PEMS equipment shall be done in a way to influence the vehicle emissions or performance or both to the minimum extent possible. Care should be exercised to minimise the mass of the installed equipment and potential aerodynamic modifications of the test vehicle. The vehicle payload shall be in accordance with point 5.1. 7.4. RDE tests shall be conducted on working days as defined for the Union in Council Regulation (EEC, Euratom) No 1182/71 (3). 7.5. RDE tests shall be conducted on paved roads and streets (e.g. off-road operation is not permitted). 7.6 Prolonged idling shall be avoided after the first ignition of the combustion engine at the beginning of the emissions test. If the engine stalls during the test, it may be restarted, but the sampling shall not be interrupted. 8.1. The fuel, lubricant and reagent (if applicable) used for RDE testing shall be within the specifications issued by the manufacturer for vehicle operation by the customer. 8.2. Samples of fuel, lubricant and reagent (if applicable) shall be taken and kept for at least 1 year. 9.1. The test shall be conducted in accordance with Appendix 1 of this Annex. 9.2. The trip shall fulfil the requirements set out in points 4 to 8. 9.3. It shall not be permitted to combine data of different trips or to modify or remove data from a trip. 9.4. After establishing the validity of a trip according to Point 9.2 emission results shall be calculated using the methods laid down in Appendix 5 and Appendix 6 of this Annex. 9.5. If during a particular time interval the ambient conditions are extended according to point 5.2, the emissions during this particular time interval calculated according to Appendix 4 of this Annex shall be divided by a value ext before being evaluated for compliance with the requirements of this Annex. 9.6. The cold start is defined in accordance with point 4 of Appendix 4 of this Annex. Until specific requirements for emissions at cold start are applied, the latter shall be recorded but excluded from the emissions evaluation. This Appendix describes the test procedure to determine exhaust emissions from light passenger and commercial vehicles using a Portable Emissions Measurement System. The test shall be carried out with a PEMS, composed of components specified in points 3.1.1 to 3.1.5. If applicable, a connection with the vehicle ECU may be established to determine relevant engine and vehicle parameters as specified in point 3.2. 3.1.1. Analysers to determine the concentration of pollutants in the exhaust gas. 3.1.2. One or multiple instruments or sensors to measure or determine the exhaust mass flow. 3.1.3. A Global Positioning System to determine the position, altitude and, speed of the vehicle. 3.1.4. If applicable, sensors and other appliances being not part of the vehicle, e.g. to measure ambient temperature, relative humidity, air pressure, and vehicle speed. 3.1.5. An energy source independent of the vehicle to power the PEMS. Test parameters as specified in Table 1 of this Annex shall be measured, recorded at a constant frequency of 1,0 Hz or higher and reported according to the requirements of Appendix 8. If ECU parameters are obtained, these should be made available at a substantially higher frequency than the parameters recorded by PEMS to ensure correct sampling. The PEMS analysers, flow-measuring instruments and sensors shall comply with the requirements laid down in Appendices 2 and 3 of this Annex. The preparation of the vehicle shall include a general technical and operational check. The installation of the PEMS shall follow the instructions of the PEMS manufacturer and the local health and safety regulations. The PEMS should be installed as to minimise during the test electromagnetic interferences as well as exposure to shocks, vibration, dust and variability in temperature. The installation and operation of the PEMS shall be leak-tight and minimise heat loss. The installation and operation of PEMS shall not change the nature of the exhaust gas nor unduly increase the length of the tailpipe. To avoid the generation of particles, connectors shall be thermally stable at the exhaust gas temperatures expected during the test. It is recommended not to use elastomer connectors to connect the vehicle exhaust outlet and the connecting tube. Elastomer connectors, if used, shall have a minimum exposure to the exhaust gas to avoid artefacts at high engine load. The installation and operation of the PEMS shall not unduly increase the static pressure at the exhaust outlet. If technically feasible, any extension to facilitate the sampling or connection with the exhaust mass flow meter shall have an equivalent, or larger, cross-sectional area as the exhaust pipe. Whenever used, the exhaust mass flow meter shall be attached to the vehicle's tailpipe(s) according to the recommendations of the EFM manufacturer. The measurement range of the EFM shall match the range of the exhaust mass flow rate expected during the test. The installation of the EFM and any exhaust pipe adaptors or junctions shall not adversely affect the operation of the engine or exhaust after-treatment system. A minimum of four pipe diameters or 150 mm of straight tubing, whichever is larger, shall be placed either side of the flow-sensing element. When testing a multi-cylinder engine with a branched exhaust manifold, it is recommended to combine the manifolds upstream of the exhaust mass flow meter and to increase the cross section of the piping appropriately as to minimise backpressure in the exhaust. If this is not feasible, exhaust flow measurements with several exhaust mass flow meters shall be considered. The wide variety of exhaust pipe configurations, dimensions and expected exhaust mass flow rates may require compromises, guided by good engineering judgement, when selecting and installing the EFM(s). If measurement accuracy requires, it is permissible to install an EFM with a diameter smaller than that of the exhaust outlet or the total cross-sectional area of multiple outlets, providing it does not adversely affect the operation or the exhaust after-treatment as specified in point 3.4.2. The GPS antenna should be mounted, e.g. at the highest possible location, as to ensure good reception of the satellite signal. The mounted GPS antenna shall interfere as little as possible with the vehicle operation. If desired, relevant vehicle and engine parameters listed in Table 1 can be recorded by using a data logger connected with the ECU or the vehicle network following standards, e.g. ISO 15031-5 or SAE J1979, OBD-II, EOBD or WWH-OBD. If applicable, manufacturers shall disclose parameter labels to allow the identification of required parameters. Vehicle speed sensors, temperature sensors, coolant thermocouples or any other measurement device not part of the vehicle shall be installed to measure the parameter under consideration in a representative, reliable and accurate manner without unduly interfering with the vehicle operation and the functioning of other analysers, flow-measuring instruments, sensors and signals. Sensors and auxiliary equipment shall be powered independently of the vehicle. Emissions sampling shall be representative and conducted at locations of well-mixed exhaust where the influence of ambient air downstream of the sampling point is minimal. If applicable, emissions shall be sampled downstream of the exhaust mass flow meter, respecting a distance of at least 150 mm to the flow sensing element. The sampling probes shall be fitted at least 200 mm or three times the diameter of the exhaust pipe, whichever is larger, upstream of the vehicle's exit of the exhaust outlet, which is the point at which the exhaust exits the PEMS sampling installation into the environment. If the PEMS feeds back a flow to the tail pipe, this shall occur downstream of the sampling probe in a manner that does not affect during engine operation the nature of the exhaust gas at the sampling point(s). If the length of the sample line is changed, the system transport times shall be verified and if necessary corrected. If the engine is equipped with an exhaust after-treatment system, the exhaust sample shall be taken downstream of the exhaust after-treatment system. When testing a vehicle with a multi-cylinder engine and branched exhaust manifold, the inlet of the sampling probe shall be located sufficiently far downstream so as to ensure that the sample is representative of the average exhaust emissions of all cylinders. In multi-cylinder engines, having distinct groups of manifolds, such as in a “V” engine configuration, the manifolds shall be combined upstream of the sampling probe. If this is technically not feasible, multi-point sampling at locations of well-mixed exhaust free of ambient air shall be considered. In this case, the number and location of sampling probes shall match as far as possible that of the exhaust mass flow meters. In case of unequal exhaust flows, proportional sampling or sampling with multiple analysers shall be considered. If particles are measured, the exhaust shall be sampled from the centre of the exhaust stream. If several probes are used for emissions sampling, the particle sampling probe shall be placed upstream of the other sampling probes. If hydrocarbons are measured, the sampling line shall be heated to 463 ± 10 K (190 ± 10 °C). For the measurement of other gaseous components with or without cooler, the sampling line shall be kept at a minimum of 333 K (60 °C) as to avoid condensation and to ensure appropriate penetration efficiencies of the various gases. For low pressure sampling systems, the temperature can be lowered corresponding to the pressure decrease provided that the sampling system ensures a penetration efficiency of 95 % for all regulated gaseous pollutants. If particles are sampled, the sampling line from the raw exhaust sample point shall be heated to a minimum of 373 K (100 °C). The residence time of the sample in the particle sampling line shall be less than 3 s until reaching first dilution or the particle counter. After the installation of PEMS is completed, a leak check shall be performed at least once for each PEMS-vehicle installation as prescribed by the PEMS manufacturer or as follows. The probe shall be disconnected from the exhaust system and the end plugged. The analyser pump shall be switched on. After an initial stabilisation period all flow meters shall read approximately zero in the absence of a leak. Else, the sampling lines shall be checked and the fault corrected. The leakage rate on the vacuum side shall not exceed 0,5 per cent of the in-use flow rate for the portion of the system being checked. The analyser flows and bypass flows may be used to estimate the in-use flow rates. Alternatively, a concentration step change at the beginning of the sampling line shall be introduced by switching from zero to span gas while maintaining the same pressure conditions as under normal system operation. If for a correctly calibrated analyser after an adequate period of time the reading is ≤ 99 per cent compared to the introduced concentration, the leakage problem shall be corrected. The PEMS shall be switched on, warmed up and stabilised according to the specifications of the PEMS manufacturer until, e.g. pressures, temperatures and flows have reached their operating set points. The sampling system, consisting of the sampling probe, sampling lines and the analysers, shall be prepared for testing by following the instruction of the PEMS manufacturer. It shall be ensured that the sampling system is clean and free of moisture condensation. If used for measuring the exhaust mass flow, the EFM shall be purged and prepared for operation in accordance with the specifications of the EFM manufacturer. This procedure shall, if applicable, remove condensation and deposits from the lines and the associated measurement ports. Zero and span calibration adjustments of the analysers shall be performed using calibration gases that meet the requirements of point 5 of Appendix 2. The calibration gases shall be chosen to match the range of pollutant concentrations expected during the emissions test. The zero level of the analyser shall be recorded by sampling HEPA filtered ambient air. The signal shall be recorded at a constant frequency of at least 1,0 Hz over a period of 2 min and averaged; the permissible concentration value shall be determined once suitable measurement equipment becomes available. the ECU; if vehicle speed is determined by the ECU, the total trip distance shall be validated according to point 3 of Appendix 3 and the ECU speed signal adjusted, if necessary to fulfil the requirements of point 3.3 of Appendix 3. Alternatively, the total trip distance as determined by the ECU shall be compared with a reference distance obtained from a digital road network or topographic map. The total trip distance determined by the ECU shall deviate by no more than 4 % from the reference. The correctness of connections with all sensors and, if applicable, the ECU shall be verified. If engine parameters are retrieved, it shall be ensured that the ECU reports values correctly (e.g. zero engine speed (rpm) while the combustion engine is in key-on-engine-off status). The PEMS shall function free of warning signals and error indication. Sampling, measurement and recording of parameters shall begin prior to the start of the engine. To facilitate time alignment, it is recommended to record the parameters that are subject to time alignment either by a single data recording device or with a synchronised time stamp. Before as well as directly after engine start, it shall be confirmed that all necessary parameters are recorded by the data logger. Sampling, measurement and recording of parameters shall continue throughout the on-road test of the vehicle. The engine may be stopped and started, but emissions sampling and parameter recording shall continue. Any warning signals, suggesting malfunctioning of the PEMS, shall be documented and verified. Parameter recording shall reach a data completeness of higher than 99 %. Measurement and data recording may be interrupted for less than 1 % of the total trip duration but for no more than a consecutive period of 30 s solely in the case of unintended signal loss or for the purpose of PEMS system maintenance. Interruptions may be recorded directly by the PEMS but it is not permissible to introduce interruptions in the recorded parameter via the pre-processing, exchange or post-processing of data. If conducted, auto zeroing shall be performed against a traceable zero standard similar to the one used to zero the analyser. It is strongly recommended to initiate PEMS system maintenance during periods of zero vehicle speed. The end of the test is reached when the vehicle has completed the trip and the combustion engine is switched off. The data recording shall continue until the response time of the sampling systems has elapsed. The zero and span of the analysers of gaseous components shall be checked by using calibration gases identical to the ones applied under point 4.5 to evaluate the analyser response drift compared to the pre-test calibration. It is permissible to zero the analyser prior to verifying the span drift, if the zero drift was determined to be within the permissible range. The post-test drift check shall be completed as soon as possible after the test and before the PEMS, or individual analysers or sensors, are turned off or have switched into a non-operating mode. The difference between the pre-test and post-test results shall comply with the requirements specified in Table 2. If the difference between the pre-test and post-test results for the zero and span drift is higher than permitted, all test results shall be voided and the test repeated. The zero level of the analyser shall be recorded by sampling HEPA filtered ambient air. The signal shall be recorded over a period of 2 min and averaged; the permissible final concentration shall be defined once suitable measurement equipment becomes available. If the difference between the pre-test and post-test zero and span check is higher than permitted, all test results shall be voided and the test repeated. The calibrated range of the analysers shall account at least for 90 % of the concentration values obtained from 99 % of the measurements of the valid parts of the emissions test. It is permissible that 1 % of the total number of measurements used for evaluation exceeds the calibrated range of the analysers by up to a factor of two. If these requirements are not met, the test shall be voided. This appendix sets out the specifications and calibration of PEMS components and signals. The linearity of analysers, flow-measuring instruments, sensors and signals, shall be traceable to international or national standards. Any sensors or signals that are not directly traceable, e.g. simplified flow-measuring instruments shall be calibrated alternatively against chassis dynamometer laboratory equipment that has been calibrated against international or national standards. All analysers, flow-measuring instruments, sensors and signals shall comply with the linearity requirements given in Table 1. If air flow, fuel flow, the air-to-fuel ratio or the exhaust mass flow rate is obtained from the ECU, the calculated exhaust mass flow rate shall meet the linearity requirements specified in Table 1.
for other relevant instruments, such as exhaust mass flow meters and traceably calibrated sensors, whenever damage is observed, as required by internal audit procedures, by the instrument manufacturer or by ISO 9000 but no longer than one year before the actual test. The linearity requirements according to point 3.2 for sensors or ECU signals that are not directly traceable shall be performed once for each PEMS set-up with a traceably calibrated measurement device on the chassis dynamometer. The relevant analysers, instruments and sensors shall be brought to their normal operating condition according to the recommendations of their manufacturer. The analysers, instruments and sensors shall be operated at their specified temperatures, pressures and flows. The analyser, flow-measuring instrument or sensor shall be set at zero by introducing a zero signal. For gas analysers, purified synthetic air or nitrogen shall be introduced to the analyser port via a gas path that is as direct and short as possible. The analyser, flow-measuring instrument or sensor shall be spanned by introducing a span signal. For gas analysers, an appropriate span gas shall be introduced to the analyser port via a gas path that is as direct and short as possible. The zero procedure of (a) shall be repeated. The verification shall be established by introducing at least 10, approximately equally spaced and valid, reference values (including zero). The reference values with respect to the concentration of components, the exhaust mass flow rate or any other relevant parameter shall be chosen to match the range of values expected during the emissions test. For measurements of exhaust mass flow, reference points below 5 % of the maximum calibration value can be excluded from the linearity verification. For gas analysers, known gas concentrations in accordance with point 5 shall be introduced to the analyser port. Sufficient time for signal stabilisation shall be given. The values under evaluation and, if needed, the reference values shall be recorded at a constant frequency of at least 1,0 Hz over a period of 30 seconds. The standard error of estimate (SEE) of y on x and the coefficient of determination (r2) shall be calculated for each measurement parameter and system. The linear regression parameters shall meet the requirements specified in Table 1. Non-traceable flow-measuring instruments, sensors or ECU signals that cannot directly be calibrated according to traceable standards, shall be calibrated on the chassis dynamometer. The procedure shall follow as far as applicable, the requirements of Annex 4a to UN/ECE Regulation No 83. If necessary, the instrument or sensor to be calibrated shall be installed on the test vehicle and operated according to the requirements of Appendix 1. The calibration procedure shall follow whenever possible the requirements of point 3.4.2; at least 10 appropriate reference values shall be selected as to ensure that at least 90 % of the maximum value expected to occur during the emissions test is covered. If a not directly traceable flow-measuring instrument, sensor or ECU signal for determining exhaust flow is to be calibrated, a traceably calibrated reference exhaust mass flow meter or the CVS shall be attached to the vehicle's tailpipe. It shall be ensured that the vehicle exhaust is accurately measured by the exhaust mass flow meter according to point 3.4.3 of Appendix 1. The vehicle shall be operated by applying constant throttle at a constant gear selection and chassis dynamometer load. The gaseous components shall be measured with analysers specified in points 1.3.1 to 1.3.5 of Appendix 3, Annex 4A to UN/ECE Regulation No 83, 07 series of amendments. If an NDUV analyser measures both NO and NO2, a NO2/NO converter is not required. a demonstration that the influence of vibrations, accelerations and ambient temperature on the analyser reading does not exceed the noise requirements for analysers set out in point 4.2.4. Approval authorities may request additional information to substantiate equivalency or refuse approval if measurements demonstrate that an alternative analyser is not equivalent to a standard analyser. In addition to the linearity requirements defined for each analyser in point 3, the compliance of analyser types with the specifications laid down in points 4.2.2 to 4.2.8 shall be demonstrated by the analyser manufacturer. Analysers shall have a measuring range and response time appropriate to measure with adequate accuracy the concentrations of the exhaust gas components at the applicable emissions standard under transient and steady state conditions. The sensitivity of the analysers to shocks, vibration, aging, variability in temperature and air pressure as well as electromagnetic interferences and other impacts related to vehicle and analyser operation shall be limited as far as possible. The accuracy, defined as the deviation of the analyser reading from the reference value, shall not exceed 2 % of reading or 0,3 % of full scale, whichever is larger. The precision, defined as 2,5 times the standard deviation of 10 repetitive responses to a given calibration or span gas, shall be no greater than 1 % of the full scale concentration for a measurement range equal or above 155 ppm (or ppmC1) and 2 % of the full scale concentration for a measurement range of below 155 ppm (or ppmC1). The noise, defined as two times the root mean square of ten standard deviations, each calculated from the zero responses measured at a constant recording frequency of at least 1,0 Hz during a period of 30 seconds, shall not exceed 2 % of full scale. Each of the 10 measurement periods shall be interspersed with an interval of 30 seconds in which the analyser is exposed to an appropriate span gas. Before each sampling period and before each span period, sufficient time shall be given to purge the analyser and the sampling lines. 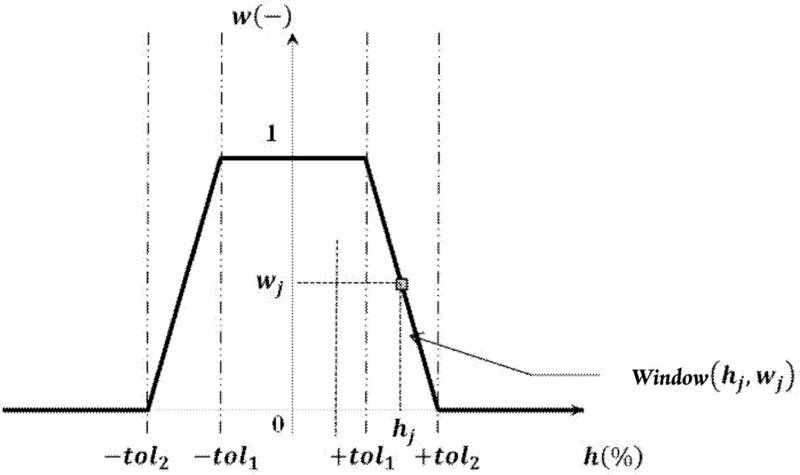 The drift of the zero response, defined as the mean response to a zero gas during a time interval of at least 30 seconds, shall comply with the specifications given in Table 2. The drift of the span response, defined as the mean response to a span gas during a time interval of at least 30 seconds, shall comply with the specifications given in Table 2. Rise time is defined as the time between the 10 per cent and 90 per cent response of the final reading (t 90 – t 10; see point 4.4). The rise time of PEMS analysers shall not exceed 3 seconds. Exhaust gases may be measured wet or dry. A gas-drying device, if used, shall have a minimal effect on the composition of the measured gases. Chemical dryers are not permitted. The provisions in points 4.3.2 to 4.3.5 define additional performance requirements for specific analyser types and apply only to cases, in which the analyser under consideration is used for PEMS emission measurements. If a NOX converter is applied, for example to convert NO2 into NO for analysis with a chemiluminescence analyser, its efficiency shall be tested by following the requirements of point 2.4 of Appendix 3 of Annex 4a to UN/ECE Regulation No 83, 07 series of amendments. The efficiency of the NOX converter shall be verified no longer than one month before the emissions test. If hydrocarbons are measured, the FID shall be adjusted at intervals specified by the analyser manufacturer by following point 2.3.1 of Appendix 3 of Annex 4a to UN/ECE Regulation No 83, 07 series of amendments. A propane-in-air or propane-in-nitrogen span gas shall be used to optimise the response in the most common operating range. If hydrocarbons are measured, the hydrocarbon response factor of the FID shall be verified by following the provisions of point 2.3.3 of Appendix 3 of Annex 4a to UN/ECE Regulation No 83, 07 series of amendments, using propane-in-air or propane-in-nitrogen as span gases and purified synthetic air or nitrogen as zero gases, respectively. The oxygen interference check shall be performed when introducing an analyser into service and after major maintenance intervals. A measuring range shall be chosen in which the oxygen interference check gases fall in the upper 50 per cent. The test shall be conducted with the oven temperature set as required. The specifications of the oxygen interference check gases are described in point 5.3. The analyser shall be set at zero. The analyser shall be spanned with a 0 per cent oxygen blend for positive ignition engines and a 21 per cent oxygen blend for compression ignition engines. The zero response shall be rechecked. If it has changed by more than 0,5 per cent of full scale, steps (i) and (ii) shall be repeated. The 5 per cent and 10 per cent oxygen interference check gases shall be introduced. The zero response shall be rechecked. If it has changed by more than ± 1 per cent of full scale, the test shall be repeated. is the measured HC concentration in step (d) [ppmC1]. The oxygen interference E O2 shall be less than ± 1,5 per cent for all required oxygen interference check gases. If the oxygen interference E O2 is greater than ± 1,5 per cent, corrective action may be taken by incrementally adjusting the air flow (above and below the manufacturer's specifications), the fuel flow and the sample flow. The oxygen interference check shall be repeated for each new setting. If hydrocarbons are analysed, a NMC can be used to remove non-methane hydrocarbons from the gas sample by oxidising all hydrocarbons except methane. Ideally, the conversion for methane is 0 per cent and for the other hydrocarbons represented by ethane is 100 per cent. For the accurate measurement of NMHC, the two efficiencies shall be determined and used for the calculation of the NMHC emissions (see point 9.2 of Appendix 4). It is not necessary to determine the methane conversion efficiency in case the NMC-FID is calibrated according to method (b) in point 9.2 of Appendix 4 by passing the methane/air calibration gas through the NMC. Other gases than the ones being analysed can affect the analyser reading. A check for interference effects and the correct functionality of analysers shall be performed by the analyser manufacturer prior to market introduction at least once for each type of analyser or device addressed in points (b) to (f). Water and CO2 can interfere with the measurements of the CO analyser. Therefore, a CO2 span gas having a concentration of 80 to 100 per cent of full scale of the maximum operating range of the CO analyser used during the test shall be bubbled through water at room temperature and the analyser response recorded. The analyser response shall not be more than 2 per cent of the mean CO concentration expected during normal on-road testing or ± 50 ppm, whichever is larger. The interference check for H2O and CO2 may be run as separate procedures. If the H2O and CO2 levels used for the interference check are higher than the maximum levels expected during the test, each observed interference value shall be scaled down by multiplying the observed interference with the ratio of the maximum expected concentration value during the test and the actual concentration value used during this check. Separate interference checks with concentrations of H2O that are lower than the maximum concentration expected during the test may be run and the observed H2O interference shall be scaled up by multiplying the observed interference with the ratio of the maximum H2O concentration value expected during the test and the actual concentration value used during this check. The sum of the two scaled interference values shall meet the tolerance specified in this point. The two gases of concern for CLD and HCLD analysers are CO2 and water vapour. The quench response to these gases is proportional to the gas concentrations. A test shall determine the quench at the highest concentrations expected during the test. If the CLD and HCLD analysers use quench compensation algorithms that utilise H2O or CO2 measurement analysers or both, quench shall be evaluated with these analysers active and with the compensation algorithms applied. is the undiluted NO concentration measured with the CLD or HCLD [ppm]. Alternative methods of diluting and quantifying of CO2 and NO span gas values such as dynamic mixing/blending are permitted upon approval of the approval authority. is the actual water vapour concentration [%]. The combined CO2 and water quench shall not exceed 2 per cent of full scale. The analyser and chiller shall be set up by following the operating instructions of the manufacturer; adjustments should be made as to optimise the analyser and chiller performance. A zero calibration and span calibration at concentration values expected during emissions testing shall be performed for the analyser. A NO2 calibration gas shall be selected that matches as far as possible the maximum NO2 concentration expected during emissions testing. The NO2 calibration gas shall overflow at the gas sampling system's probe until the NOX response of the analyser has stabilised. The mean concentration of the stabilised NOX recordings over a period of 30 s shall be calculated and recorded as NOX,ref. The flow of the NO2 calibration gas shall be stopped and the sampling system saturated by overflowing with a dew point generator's output, set at a dew point of 50 °C. The dew point generator's output shall be sampled through the sampling system and chiller for at least 10 minutes until the chiller is expected to be removing a constant rate of water. Upon completion of (iv), the sampling system shall again be overflown by the NO2 calibration gas used to establish NOX,ref until the total NOX response has stabilised. The mean concentration of the stabilised NOX recordings over a period of 30 s shall be calculated and recorded as NOX,m. NOX,m shall be corrected to NOX,dry based upon the residual water vapour that passed through the chiller at the chiller's outlet temperature and pressure. The calculated NOX,dry shall at least amount to 95 % of NOX,ref. A sample dryer removes water, which can otherwise interfere with the NOX measurement. For dry CLD analysers, it shall be demonstrated that at the highest expected water vapour concentration H m the sample dryer maintains the CLD humidity at ≤ 5 g water/kg dry air (or about 0,8 per cent H2O), which is 100 per cent relative humidity at 3,9 °C and 101,3 kPa or about 25 per cent relative humidity at 25 °C and 101,3 kPa. Compliance may be demonstrated by measuring the temperature at the outlet of a thermal sample dryer or by measuring the humidity at a point just upstream of the CLD. The humidity of the CLD exhaust might also be measured as long as the only flow into the CLD is the flow from the sample dryer. Liquid water remaining in an improperly designed sample dryer can remove NO2 from the sample. If a sample dryer is used in combination with a NDUV analyser without an NO2/NO converter upstream, water could therefore remove NO2 from the sample prior to the NOX measurement. The sample dryer shall allow for measuring at least 95 per cent of the NO2 contained in a gas that is saturated with water vapour and consists of the maximum NO2 concentration expected to occur during a vehicle test. For the response time check, the settings of the analytical system shall be exactly the same as during the emissions test (i.e. pressure, flow rates, filter settings in the analysers and all other parameters influencing the response time). The response time shall be determined with gas switching directly at the inlet of the sample probe. The gas switching shall be done in less than 0,1 second. The gases used for the test shall cause a concentration change of at least 60 per cent full scale of the analyser. The concentration trace of each single gas component shall be recorded. The delay time is defined as the time from the gas switching (t 0) until the response is 10 per cent of the final reading (t 10). The rise time is defined as the time between 10 per cent and 90 per cent response of the final reading (t 90 – t 10). The system response time (t 90) consists of the delay time to the measuring detector and the rise time of the detector. For time alignment of the analyser and exhaust flow signals, the transformation time is defined as the time from the change (t 0) until the response is 50 per cent of the final reading (t 50). The system response time shall be ≤ 12 s with a rise time of ≤ 3 seconds for all components and all ranges used. When using a NMC for the measurement of NMHC, the system response time may exceed 12 seconds. The shelf life of calibration and span gases shall be respected. Pure and mixed calibration and span gases shall fulfil the specifications of points 3.1 and 3.2 of Appendix 3 of Annex 4A to UN/ECE Regulation No 83, 07 series of amendments. In addition, NO2 calibration gas is permissible. The concentration of the NO2 calibration gas shall be within two per cent of the declared concentration value. The amount of NO contained in NO2 calibration gas shall not exceed 5 per cent of the NO2 content. Gas dividers, i.e. precision blending devices that dilute with purified N2 or synthetic air, can be used to obtain calibration and span gases. The accuracy of the gas divider shall be such that the concentration of the blended calibration gases is accurate to within ± 2 per cent. The verification shall be performed at between 15 and 50 per cent of full scale for each calibration incorporating a gas divider. An additional verification may be performed using another calibration gas, if the first verification has failed. Optionally, the gas divider may be checked with an instrument which by nature is linear, e.g. using NO gas in combination with a CLD. The span value of the instrument shall be adjusted with the span gas directly connected to the instrument. The gas divider shall be checked at the settings typically used and the nominal value shall be compared with the concentration measured by the instrument. The difference shall in each point be within ± 1 per cent of the nominal concentration value. Oxygen interference check gases consist of a blend of propane, oxygen and nitrogen and shall contain propane at a concentration of 350 ± 75 ppmC1. The concentration shall be determined by gravimetric methods, dynamic blending or the chromatographic analysis of total hydrocarbons plus impurities. The oxygen concentrations of the oxygen interference check gases shall meet the requirements listed in Table 3; the remainder of the oxygen interference check gas shall consist of purified nitrogen. This section will define future requirements for analysers for measuring particle emissions, once their measurement becomes mandatory. Instruments, sensors or signals for measuring the exhaust mass flow rate shall have a measuring range and response time appropriate for the accuracy required to measure the exhaust mass flow rate under transient and steady state conditions. The sensitivity of instruments, sensors and signals to shocks, vibration, aging, variability in temperature, ambient air pressure, electromagnetic interferences and other impacts related to vehicle and instrument operation shall be on a level as to minimise additional errors. Each individual exhaust mass flow meter shall fulfil the linearity requirements set out in point 3. Furthermore, the instrument manufacturer shall demonstrate the compliance of each type of exhaust mass flow meter with the specifications in points 7.2.3 to 7.2.9. It is permissible to calculate the exhaust mass flow rate based on air flow and fuel flow measurements obtained from traceably calibrated sensors if these fulfil the linearity requirements of point 3, the accuracy requirements of point 8 and if the resulting exhaust mass flow rate is validated according to point 4 of Appendix 3. In addition, other methods that determine the exhaust mass flow rate based on not directly traceable instruments and signals, such as simplified exhaust mass flow meters or ECU signals are permissible if the resulting exhaust mass flow rate fulfils the linearity requirements of point 3 and is validated according to point 4 of Appendix 3. The measurement performance of exhaust mass flow meters shall be verified with air or exhaust gas against a traceable standard such as, e.g. a calibrated exhaust mass flow meter or a full flow dilution tunnel. The compliance of exhaust mass flow meters with points 7.2.3 and 7.2.9 shall be verified no longer than one year before the actual test. The accuracy, defined as the deviation of the EFM reading from the reference flow value, shall not exceed ± 2 % of the reading, 0,5 % of full scale or ± 1,0 % of the maximum flow at which the EFM has been calibrated, whichever is larger. The precision, defined as 2,5 times the standard deviation of 10 repetitive responses to a given nominal flow, approximately in the middle of the calibration range, shall be no greater than ±1 per cent of the maximum flow at which the EFM has been calibrated. The noise, defined as two times the root mean square of ten standard deviations, each calculated from the zero responses measured at a constant recording frequency of at least 1,0 Hz during a period of 30 seconds, shall not exceed 2 per cent of the maximum calibrated flow value. Each of the 10 measurement periods shall be interspersed with an interval of 30 seconds in which the EFM is exposed to the maximum calibrated flow. Zero response is defined as the mean response to zero flow during a time interval of at least 30 seconds. The zero response drift can be verified based on the reported primary signals, e.g. pressure. The drift of the primary signals over a period of 4 hours shall be less than ± 2 per cent of the maximum value of the primary signal recorded at the flow at which the EFM was calibrated. Span response is defined as the mean response to a span flow during a time interval of at least 30 seconds. The span response drift can be verified based on the reported primary signals, e.g. pressure. The drift of the primary signals over a period of 4 hours shall be less than ± 2 per cent of the maximum value of the primary signal recorded at the flow at which the EFM was calibrated. The rise time of the exhaust flow instruments and methods should match as far as possible the rise time of the gas analysers as specified in point 4.2.7 but shall not exceed 1 second. The response time of exhaust mass flow meters shall be determined by applying similar parameters as those applied for the emissions test (i.e. pressure, flow rates, filter settings and all other response time influences). The response time determination shall be done with gas switching directly at the inlet of the exhaust mass flow meter. The gas flow switching shall be done as fast as possible, but highly recommended in less than 0,1 second. The gas flow rate used for the test shall cause a flow rate change of at least 60 per cent full scale (FS) of the exhaust mass flow meter. The gas flow shall be recorded. The delay time is defined as the time from the gas flow switching (t 0) until the response is 10 per cent (t 10) of the final reading. The rise time is defined as the time between 10 per cent and 90 per cent response (t 90 – t 10) of the final reading. The response time (t 90) is defined as the sum of the delay time and the rise time. The exhaust mass flow meter response time (t90 ) shall be ≤ 3 seconds with a rise time (t 90 – t 10) of ≤ 1 second in accordance with point 7.2.8. Any sensor and auxiliary equipment used to determine, e.g. temperature, atmospheric pressure, ambient humidity, vehicle speed, fuel flow or intake air flow shall not alter or unduly affect the performance of the vehicle's engine and exhaust after-treatment system. The accuracy of sensors and auxiliary equipment shall fulfil the requirements of Table 4. Compliance with the requirements of Table 4 shall be demonstrated at intervals specified by the instrument manufacturer, as required by internal audit procedures or in accordance with ISO 9000. This appendix describes the requirements to validate under transient conditions the functionality of the installed PEMS as well as the correctness of the exhaust mass flow rate obtained from non-traceable exhaust mass flow meters or calculated from ECU signals. It is recommended to validate the installed PEMS once for each PEMS-vehicle combination either before the test or, alternatively, after the completion of an on-road test. The PEMS installation shall be kept unchanged in the time period between the on-road test and the validation. The PEMS shall be installed and prepared according to the requirements of Appendix 1. After the completion of the validation test until the start of the on-road test, the PEMS installation shall not be changed. The validation test shall be conducted on a chassis dynamometer, as far as applicable, under type-approval conditions by following the requirements of Annex 4a to UN/ECE Regulation No 83, 07 series of amendments or any other adequate measurement method. It is recommended to conduct the validation test with the worldwide harmonised light vehicles test cycle (WLTC) as specified in Annex 1 to UNECE Global Technical Regulation No 15. The ambient temperature shall be within the range specified in point 5.2 of this Annex. It is recommended to feed the exhaust flow extracted by the PEMS during the validation test back to the CVS. If this is not feasible, the CVS results shall be corrected for the extracted exhaust mass. If the exhaust mass flow rate is validated with an exhaust mass flow meter, it is recommended to cross-check the mass flow rate measurements with data obtained from a sensor or the ECU. The total distance-specific emissions [g/km] measured with laboratory equipment shall be calculated following Annex 4a to UN/ECE Regulation No 83, 07 series of amendments. The emissions as measured with the PEMS shall be calculated according to point 9 of Appendix 4, summed to give the total mass of pollutant emissions [g] and then divided by the test distance [km] as obtained from the chassis dynamometer. The total distance-specific mass of pollutants [g/km], as determined by the PEMS and the reference laboratory system, shall be compared and evaluated against the requirements specified in point 3.3. For the validation of NOX emission measurements, humidity correction shall be applied following point 6.6.5 of Annex 4a to UN/ECE Regulation No 83, 07 series of amendments. The PEMS validation results shall fulfil the requirements given in Table 1. If any permissible tolerance is not met, corrective action shall be taken and the PEMS validation shall be repeated. In addition to fulfilling the linearity requirements of point 3 of Appendix 2 under steady-state conditions, the linearity of non-traceable exhaust mass flow meters or the exhaust mass flow rate calculated from non-traceable sensors or ECU signals shall be validated under transient conditions for each test vehicle against a calibrated exhaust mass flow meter or the CVS. The validation test procedure can be executed without the installation of the PEMS but shall generally follow the requirements defined in Annex 4a to UN/ECE Regulation No 83, 07 series of amendments and the requirements pertinent to exhaust mass flow meters defined in Appendix 1. The validation test shall be conducted on a chassis dynamometer under type-approval conditions, as far as applicable, by following the requirements of Annex 4a to UN/ECE Regulation No 83, 07 series of amendments. The test cycle shall be the worldwide harmonised light vehicles test cycle (WLTC) as specified in Annex 1 to UNECE Global Technical Regulation No 15. As reference, a traceably calibrated flow meter shall be used. The ambient temperature can be any within the range specified in point 5.2 of this Annex. The installation of the exhaust mass flow meter and the execution of the test shall fulfil the requirement of point 3.4.3 of Appendix 1 of this Annex. The signal under validation and the reference signal shall be time corrected by following, as far as applicable, the requirements of point 3 of Appendix 4. Points below 10 % of the maximum flow value shall be excluded from the further analysis. The linear regression parameters shall meet the requirements specified in Table 2. The linearity requirements given in Table 2 shall be fulfilled. If any permissible tolerance is not met, corrective action shall be taken and the validation shall be repeated. This appendix describes the procedure to determine the instantaneous mass and particle number emissions [g/s; #/s] that shall be used for the subsequent evaluation of a test trip and the calculation of the final emission result as described in Appendices 5 and 6. For the correct calculation of distance-specific emissions, the recorded traces of component concentrations, exhaust mass flow rate, vehicle speed, and other vehicle data shall be time corrected. To facilitate the time correction, data which are subject to time alignment shall be recorded either in a single data recording device or with a synchronised timestamp following point 5.1 of Appendix 1. The time correction and alignment of parameters shall be carried out by following the sequence described in points 3.1 to 3.3.
is the transformation time t of the analyser measuring component i.
is the transformation time t of the exhaust mass flow meter. In case the exhaust mass flow rate is determined by ECU data or a sensor, an additional transformation time shall be considered and obtained by cross-correlation between the calculated exhaust mass flow rate and the exhaust mass flow rate measured following point 4 of Appendix 3. Other data obtained from a sensor or the ECU shall be time-aligned by cross-correlation with suitable emission data (e.g. component concentrations). To time align vehicle speed with the exhaust mass flow rate, it is first necessary to establish one valid speed trace. In case vehicle speed is obtained from multiple sources (e.g. the GPS, a sensor or the ECU), the speed values shall be time aligned by cross-correlation. Vehicle speed shall be time aligned with the exhaust mass flow rate by means of cross-correlation between the exhaust mass flow rate and the product of vehicle velocity and positive acceleration. The time alignment of signals whose values change slowly and within a small value range, e.g. ambient temperature, can be omitted. The cold start period covers the first 5 minutes after initial start of the combustion engine. If the coolant temperature can be reliably determined, the cold start period ends once the coolant has reached 343 K (70 °C) for the first time but no later than 5 minutes after initial engine start. Cold start emissions shall be recorded. Any instantaneous emissions or exhaust flow measurements obtained while the combustion engine is deactivated shall be recorded. In a separate step, the recorded values shall afterward be set to zero by the data post processing. The combustion engine shall be considered as deactivated if two of the following criteria apply: the recorded engine speed is < 50 rpm; the exhaust mass flow rate is measured at < 3 kg/h; the measured exhaust mass flow rate drops to < 15 % of the steady-state exhaust mass flow rate at idling. In case well-reasoned doubts exist that a trip has been conducted above of the permissible altitude as specified in point 5.2 of Annex IIIA and in case altitude has only been measured with a GPS, the GPS altitude data shall be checked for consistency and, if necessary, corrected. The consistency of data shall be checked by comparing the latitude, longitude and altitude data obtained from the GPS with the altitude indicated by a digital terrain model or a topographic map of suitable scale. Measurements that deviate by more than 40 m from altitude depicted in the topographic map shall be manually corrected and marked. The vehicle speed as determined by the GPS shall be checked for consistency by calculating and comparing the total trip distance with reference measurements obtained from either a sensor, the validated ECU or, alternatively, from a digital road network or topographic map. It is mandatory to correct GPS data for obvious errors, e.g. by applying a dead reckoning sensor, prior to the consistency check. The original and uncorrected data file shall be retained and any corrected data shall be marked. The corrected data shall not exceed an uninterrupted time period of 120 s or a total of 300 s. The total trip distance as calculated from the corrected GPS data shall deviate by no more than 4 % from the reference. If the GPS data do not meet these requirements and no other reliable speed source is available, the test results shall be voided. is the molar hydrogen ratio. NOx emissions shall not be corrected for ambient temperature and humidity. The components in the raw exhaust gas shall be measured with the measurement and sampling analysers described in Appendix 2. The raw concentrations of relevant components shall be measured in accordance with Appendix 1. The data shall be time corrected and aligned in accordance with point 3.
the calibration gas consisting of methane/air passes through the NMC. It is strongly recommended to calibrate the methane FID with methane/air through the NMC. is the ethane efficiency as determined in point 4.3.4(b) of Appendix 2. If the methane FID is calibrated through the cutter (method b), then the methane conversion efficiency as determined in point 4.3.4(a) of Appendix 2 is zero. The density used for NMHC mass calculations shall be equal to that of total hydrocarbons at 273,15 K and 101,325 kPa and is fuel-dependent. The calculation of instantaneous mass emissions according to points 11 and 12 requires determining the exhaust mass flow rate. The exhaust mass flow rate shall be determined by one of the direct measurement methods specified in point 7.2 of Appendix 2. Alternatively, it is permissible to calculate the exhaust mass flow rate as described in points 10.2 to 10.4.
is the instantaneous fuel mass flow rate [kg/s]. 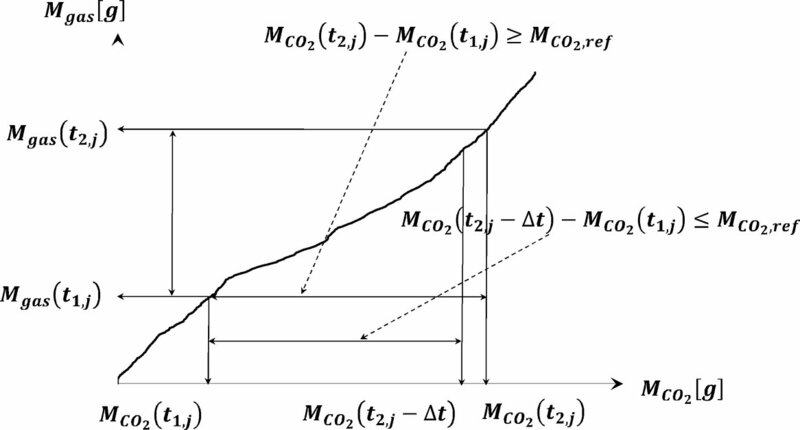 If the air mass flow rate and the fuel mass flow rate or the exhaust mass flow rate are determined from ECU recording, the calculated instantaneous exhaust mass flow rate shall meet the linearity requirements specified for the exhaust mass flow rate in point 3 of Appendix 2 and the validation requirements specified in point 4.3 of Appendix 3.
is the molar oxygen ratio (O/C). Coefficients refer to a fuel Cβ Hα Oε Nδ Sγ with β = 1 for carbon-based fuels. The concentration of HC emissions is typically low and may be omitted when calculating l i. If the air mass flow rate and air-to-fuel ratio are determined from ECU recording, the calculated instantaneous exhaust mass flow rate shall meet the linearity requirements specified for the exhaust mass flow rate in point 3 of Appendix 2 and the validation requirements specified in point 4.3 of Appendix 3. The calculated instantaneous exhaust mass flow rate shall meet the linearity requirements specified for the exhaust gas mass flow rate in point 3 of Appendix 2 and the validation requirements specified in point 4.3 of Appendix 3. This section will define future requirements for calculating instantaneous particle number emissions, once their measurement becomes mandatory. The data shall be exchanged between the measurement systems and the data evaluation software by a standardised reporting file as specified in point 2 of Appendix 8. Any pre-processing of data (e.g. time correction according to point 3 or the correction of the GPS vehicle speed signal according to point 7) shall be done with the control software of the measurement systems and shall be completed before the data reporting file is generated. If data are corrected or processed prior to entering the data reporting file, the original raw data shall be kept for quality assurance and control. Rounding of intermediate values is not permitted. Instead, intermediate values shall enter the calculation of instantaneous emissions [g/s; #/s] as reported by the analyser, flow-measuring instrument, sensor or the ECU. The Moving Averaging Window method provides an insight on the real-driving emissions (RDE) occurring during the test at a given scale. The test is divided in sub-sections (windows) and the subsequent statistical treatment aims at identifying which windows are suitable to assess the vehicle RDE performance. 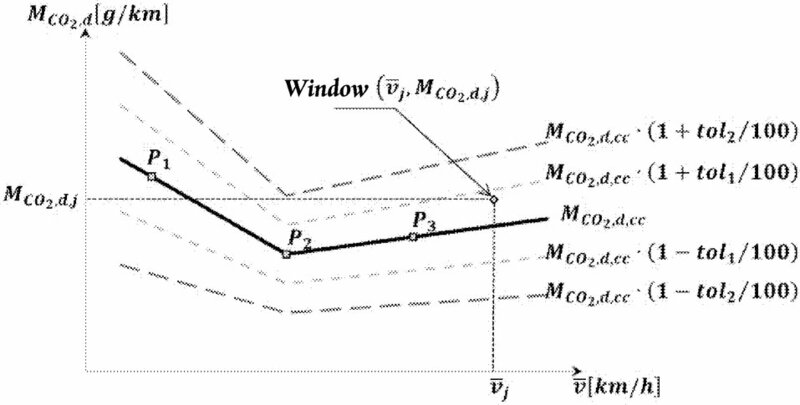 The “normality” of the windows is conducted by comparing their CO2 distance-specific emissions (29) with a reference curve. The test is complete when the test includes a sufficient number of normal windows, covering different speed areas (urban, rural, motorway). Calculation of emissions using the normal windows (point 6). weighing factor of window j. The instantaneous emissions calculated according to Appendix 4 shall be integrated using a moving averaging window method, based on the reference CO2 mass. The principle of the calculation is as follows: the mass emissions are not calculated for the complete data set, but for sub-sets of the complete data set, the length of these sub-sets being determined so as to match the CO2 mass emitted by the vehicle over the reference laboratory cycle. The moving average calculations are conducted with a time increment corresponding to the data sampling frequency. These sub-sets used to average the emissions data are referred to as “averaging windows”. The calculation described in the present point may be run from the last point (backwards) or from the first point (forward). any section of the test during which the combustion engine is switched off. The mass (or particle number) emissions M gas,j shall be determined by integrating the instantaneous emissions in g/s (or #/s for PN) calculated as specified in Appendix 4. Where Δt is the data sampling period. The CO2 masses are calculated in the windows by integrating the instantaneous emissions calculated as specified in Appendix 4 to this Annex. The reference dynamic conditions of the test vehicle are set out from the vehicle CO2 emissions versus average speed measured at type approval and referred to as “vehicle CO2 characteristic curve”. To obtain the distance-specific CO2 emissions, the vehicle shall be tested using the road load settings prescribed in the UNECE Global Technical Regulation No 15 — worldwide harmonised light vehicles test procedure (ECE/TRANS/180/Add.15). = Vehicle CO2 emissions over the Low Speed phase of the WLTP cycle × 1,2 [g/km]. = Vehicle CO2 emissions over the High Speed phase of the WLTP cycle × 1,1 [g/km]. 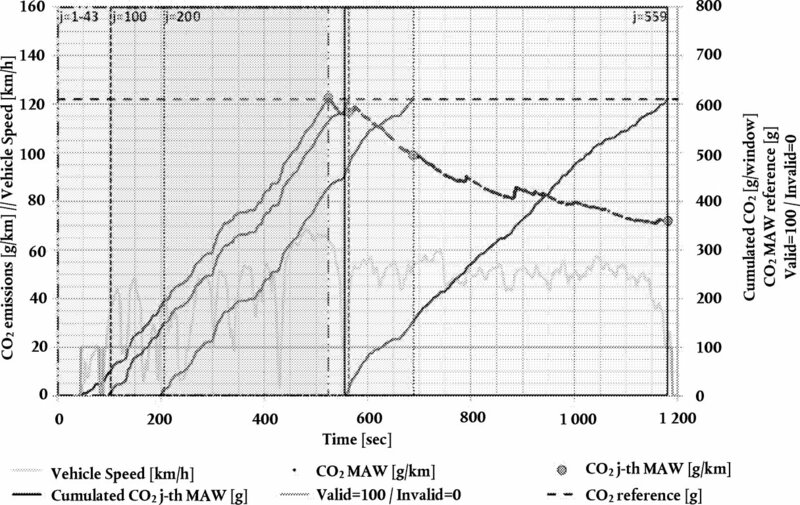 The primary tolerance and the secondary tolerance of the vehicle CO2 characteristic curve are respectively tol 1= 25 % and tol2 = 50 %. The test shall be complete when it comprises at least 15 % of urban, rural and motorway windows, out of the total number of windows. The test shall be normal when at least 50 % of the urban, rural and motorway windows are within the primary tolerance defined for the characteristic curve. If the specified minimum requirement of 50 % is not met, the upper positive tolerance tol 1 may be increased by steps of 1 % until the 50 % of normal windows target is reached. When using this mechanism, tol1 shall never exceed 30 %. The emissions shall be calculated as a weighted average of the windows distance-specific emissions separately for the urban, rural and motorway categories and the complete trip. Where fu, fr fm are equal to 0,34, 0,33 and 0,33 respectively. Where fu, fr fm are respectively equal to 0,34, 0,33 and 0,33. 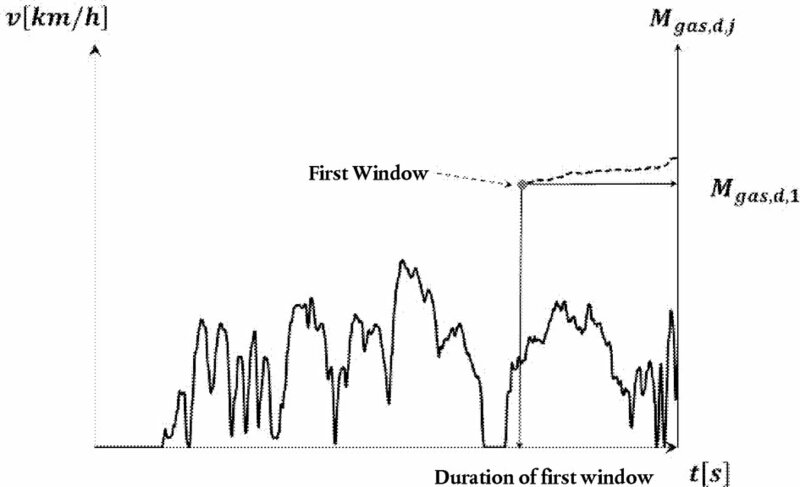 Figure 6 shows how averaging windows are defined on the basis of data recorded during an on-road test performed with PEMS. For sake of clarity, only the first 1 200 seconds of the trip are shown hereafter. Seconds 0 up to 43 as well as seconds 81 to 86 are excluded due to operation under zero vehicle speed. The first averaging window starts at t 1,1 = 0s and ends at second t 2,1 = 524 s (Table 3). The window average vehicle speed, integrated CO and NOx masses [g] emitted and corresponding to the valid data over the first averaging window are listed in Table 4. In this numerical example, the trip consists of 7 036 averaging windows. Table 5 lists the number of windows classified in urban, rural and motorway according to their average vehicle speed and divided in regions with respect to their distance to the CO2 characteristic curve. The trip is complete since it comprises at least 15 % of urban, rural and motorway windows out of the total number of windows. In addition the trip is characterised as normal since at least 50 % of the urban, rural and motorway windows are within the primary tolerances defined for the characteristic curve. This Appendix describes the data evaluation according to the power binning method, named in this appendix “evaluation by normalisation to a standardised power frequency (SPF) distribution”. 3-second moving average of the vehicle velocity in time step k, [km/h]. The power binning method uses the instantaneous emissions of the pollutants, mgas, i (g/s) calculated in accordance with Appendix 4. The mgas, i values shall be classified in accordance with the corresponding power at the wheels and the classified average emissions per power class shall be weighted to obtain the emission values for a test with a normal power distribution according to the following points. The actual wheel power Pr,i shall be the total power to overcome air resistance, rolling resistance, longitudinal inertia of the vehicle and rotational inertia of the wheels. When measured and recorded, the wheel power signal shall use a torque signal meeting the linearity requirements laid down in Appendix 2, point 3.2. As an alternative, the actual wheel power may be determined from the instantaneous CO2 emissions following the procedure laid down in point 4 of this Appendix. The standard power frequencies are defined for urban driving and for the total trip (see paragraph 3.4) and a separate evaluation of the emissions shall be made for the total trip and for the urban part. The three-second moving averages calculated according to paragraph 3.3 shall therefore be allocated later to urban and extra-urban driving conditions according to the velocity signal (v3s,k) as outlined in Table 1-1.
time step for moving average values. time step from instantaneous test data. 3.4.1. The power classes and the corresponding time shares of the power classes in normal driving are defined for normalised power values to be representative for any LDV (Table 1-2). The Pc,norm columns in Table 1-2 shall be de-normalised by multiplication with Pdrive, where Pdrive is the actual wheel power of the tested car in the type approval settings at the chassis dynamometer at vref and aref. with (PCorrected/v) being the road load force at vehicle velocity v for the NEDC test cycle defined in point 5.1.1.2.8 of Appendix 7 to Annex 4a of UNECE Regulation 83 — 07 series of amendments. TMNEDC is the inertia class of the vehicle in the type approval test, [kg]. The maximum wheel power class to be considered is the highest class in Table 1-2 which includes (Prated × 0,9). The time shares of all excluded classes shall be added to the highest remaining class. From each Pc,norm,j the corresponding Pc,j shall be calculated to define the upper and lower bounds in kW per wheel power class for the tested vehicle as shown in Figure 1. An example for this de-normalisation is given below. Each moving average value calculated according to point 3.2 shall be sorted into the de-normalised wheel power class into which the actual 3-second moving average wheel power Pw,3s,k fits. The de-normalised wheel power class limits have to be calculated according to point 3.3. The classification shall be done for all three-second moving averages of the entire valid trip data as well as for the all urban trip parts. Additionally all moving averages classified to urban according to the velocity limits defined in Table 1-1 shall be classified into one set of urban power classes independently of the time when the moving average appeared in the trip. Then the average of all three-second moving average values within a wheel power class shall be calculated for each wheel power class per parameter. The equations are described below and shall be applied once for the urban data set and once for the total data set. then: class index for emissions and velocity = j.
then: countsj = n + 1 (countsj is counting the number of 3-second moving average emission value in a power class to check later the minimum coverage demands). For a valid test the time shares of the single wheel power classes shall be in the ranges listed in Table 4. In addition to the requirements in Table 4, a minimum coverage of 5 counts is demanded for the total trip in each wheel power class up to the class containing 90 % of the rated power to provide a sufficient sample size. A minimum coverage of five counts is required for the urban part of the trip in each wheel power class up to class No 5. If the counts in the urban part of the trip in a wheel power class above No 5 are less than five, the average class emission value shall be set to zero. The average values of each wheel power class shall be multiplied with the time share, tC,j per class according to Table 1-2 and summed up to produce the weighted average value for each parameter. This value represents the weighted result for a trip with the standardised power frequencies. The weighted averages shall be computed for the urban part of the test data using the time shares for urban power distribution as well as for the total trip using the time shares for the total. The equations are described below and shall be applied once for the urban data set and once for the total data set. 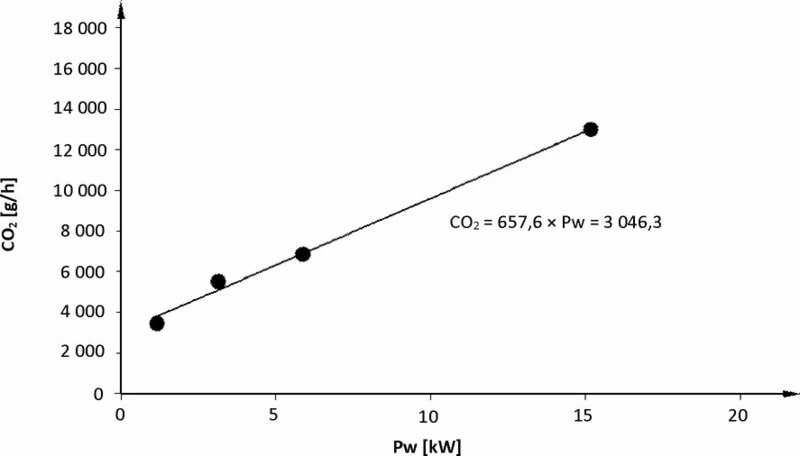 The power at the wheels (Pw,i) can be computed from the measured CO2 mass flow in 1 Hz basis. For this calculation the vehicle-specific CO2 lines (“Veline”) shall be used. The Veline shall be calculated from the vehicle type approval test in the WLTC according to the test procedure described in UNECE Global Technical Regulation No 15 — worldwide harmonised light vehicles test procedure (ECE/TRANS/180/Add.15). The average wheel power per WLTC phase shall be calculated. in 1 Hz from the driven velocity and from the chassis dynamometer settings. All wheel power values below the drag power shall be set to the drag power value. end time of the WLTC phase p, [s]. Then a linear regression shall be made with the CO2 mass flow from the bag values of the WLTC on the y-axis and from the average wheel power Pw,p per phase on the x-axis as illustrated in Figure 2.
intercept of the Veline from WLTC, [g/h]. Due to their particular characteristics, PEMS tests are not required to be performed for each “vehicle type with regard to emissions and vehicle repair and maintenance information” as defined in Article 2(1) of this Regulation, which is called in the following “vehicle emission type”. Several vehicle emission types may be put together by the vehicle manufacturer to form a “PEMS test family” according to the requirements of point 3, which shall be validated according to the requirements of point 4.
maximum engine volume of all vehicles within the PEMS test family. A PEMS test family shall comprise vehicles with similar emission characteristics. Upon the choice of the manufacturer vehicle emission types may be included in a PEMS test family only if they are identical with respect to the characteristics in points 3.1 and 3.2. 3.1.1. The approval authority issuing the emission type approval according to Regulation (EC) 715/2007. 3.1.2. A single vehicle manufacturer. 3.2.1. Propulsion type (e.g. ICE, HEV, PHEV). 3.2.2. Type(s) of fuel(s) (e.g. petrol, diesel, LPG, NG, …). Bi- or flex-fuelled vehicles may be grouped with other vehicles, with which they have one of the fuels in common. The vehicle manufacturer shall specify a value V_eng_max (= maximum engine volume of all vehicles within the PEMS test family). The engine volumes of vehicles in the PEMS test family shall not deviate more than – 22 % from V_eng_max if V_eng_max ≥ 1 500 ccm and – 32 % from V_eng_max if V_eng_max < 1 500 ccm. 3.2.10. Types and sequence of exhaust after-treatment components (e.g. three-way catalyst, oxidation catalyst, lean NOx trap, SCR, lean NOx catalyst, particulate trap). 3.2.11. Exhaust gas recirculation (with or without, internal/external, cooled/non-cooled, low/high pressure). An existing PEMS test family may be extended by adding new vehicle emission types to it. The extended PEMS test family and its validation must also fulfil the requirements of points 3 and 4. This may in particular require the PEMS testing of additional vehicles to validate the extended PEMS test family according to point 4. As an alternative to the provisions of points 3.1 to 3.2 the vehicle manufacturer may define a PEMS test family, which is identical to a single vehicle emission type. In this the requirement of point 4.1.2 for validating the PEMS test family shall not apply. 4.1.1. The vehicle manufacturer presents a representative vehicle of the PEMS test family to the type-approval authority. The vehicle shall be subject to a PEMS test carried out by a Technical Service to demonstrate compliance of the representative vehicle with the requirements of this Annex. 4.1.2. The authority responsible for issuing the emission type-approval in accordance with Regulation (EC) No 715/2007 selects additional vehicles according to the requirements of point 4.2 of this Appendix for PEMS testing carried out by a Technical Service to demonstrate compliance of the selected vehicles with the requirements of this Annex. The technical criteria for selection of an additional vehicle according to point 4.2 of this Appendix shall be recorded with the test results. 4.1.3. With agreement of the type-approval authority, a PEMS test can also be driven by a different operator witnessed by a Technical Service, provided that at least the tests of the vehicles required by of this Appendix and in total at least 50 % of the PEMS tests required by this Appendix for validating the PEMS test family are driven by a Technical Service. In such case the Technical Service remains responsible for the proper execution of all PEMS tests pursuant to the requirements of this Annex. For each validation the applicable responsibilities are considered to be borne by the manufacturer of the vehicles in the respective family, regardless of whether this manufacturer was involved in the PEMS test of the specific vehicle emission type. 4.2.1. For each combination of fuels (e.g. petrol-LPG, petrol-NG, petrol only), on which some vehicle of the PEMS test family can operate, at least one vehicle that can operate on this combination of fuels shall be selected for PEMS testing. 4.2.2. The manufacturer shall specify a value PMRH (= highest power-to-mass-ratio of all vehicles in the PEMS test family) and a value PMRL (= lowest power-to-mass-ratio of all vehicles in the PEMS test family). Here the “power-to-mass-ratio” corresponds to the ratio of the maximum net power of the internal combustion engine as indicated in point 3.2.1.8 of Appendix 3 to Annex I of this Regulation and of the reference mass as defined in Article 3(3) of Regulation (EC) No 715/2007. At least one vehicle configuration representative for the specified PMRH and one vehicle configuration representative for the specified PMRL of a PEMS test family shall be selected for testing. If the power-to-mass ratio of a vehicle deviates by not more than 5 % from the specified value for PMRH, or PMRL, the vehicle should be considered as representative for this value. 4.2.3. At least one vehicle for each transmission type (e.g. manual, automatic, DCT) installed in vehicles of the PEMS test family shall be selected for testing. 4.2.4. At least one four-wheel drive vehicle (4 × 4 vehicle) shall be selected for testing if such vehicles are part of the PEMS test family. 4.2.5. For each engine volume occurring on a vehicle in the PEMS family at least one representative vehicle shall be tested. 4.2.6. At least one vehicle for each number of installed exhaust after-treatment components shall be selected for testing. 5.1. The vehicle manufacturer provides a full description of the PEMS test family, which includes in particular the technical criteria described in point 3.2 and submits it to the responsible type approval authority. 5.2. The manufacturer attributes a unique identification number of the format MS-OEM-X-Y to the PEMS test family and communicates it to the type approval authority. Here MS is the distinguishing number of the Member State issuing the EC type-approval (34), OEM is the 3 character manufacturer, X is a sequential number identifying the original PEMS test family and Y is a counter for its extensions (starting with 0 for a PEMS test family not extended yet). 5.3. The type approval authority and the vehicle manufacturer shall maintain a list of vehicle emission types being part of a given PEMS test family on the basis of emission type approval numbers. For each emission type all corresponding combinations of vehicle type approval numbers, types, variants and versions as defined in Sections 0.10 and 0.2 of the vehicle's EC certificate of conformity shall be provided as well. 5.4. The type approval authority and the vehicle manufacturer shall maintain a list of vehicle emission types selected for PEMS testing in order validate a PEMS test family in accordance with point 4, which also provides the necessary information on how the selection criteria of point 4.2 are covered. This list shall also indicate whether the provisions of point 4.1.3 were applied for a particular PEMS test. This Appendix describes the requirements for the data exchange between the measurement systems and the data evaluation software and for the reporting and exchange of intermediate and final results after the completion of the data evaluation. The exchange and reporting of mandatory and optional parameters shall follow the requirements of point 3.2 of Appendix 1. The data specified in the exchange and reporting files of point 3 shall be reported to ensure a complete traceability of final results. Emission values as well as any other relevant parameters shall be reported and exchanged as csv-formatted data file. Parameter values shall be separated by a comma, ASCII-Code #h2C. The decimal marker of numerical values shall be a point, ASCII-Code #h2E. Lines shall be terminated by carriage return, ASCII-Code #h0D. No thousands separators shall be used. Data shall be exchanged between the measurement systems and the data evaluation software by means of a standardised reporting file that contains a minimum set of mandatory and optional parameters. The data exchange file shall be structured as follows: The first 195 lines shall be reserved for a header that provides specific information about, e.g. the test conditions, the identity and calibration of the PEMS equipment (Table 1). Lines 198-200 shall contain the labels and units of parameters. Lines 201 and all consecutive data lines shall comprise the body of the data exchange file and report parameter values (Table 2). The body of the data exchange file shall contain at least as many data lines as the test duration in seconds multiplied by the recording frequency in Hertz. Manufacturers shall record summary parameters of intermediate results as structured in Table 3. The information in Table 3 shall be obtained prior to the application of the data evaluation methods laid down in Appendices 5 and 6. The vehicle manufacturer shall record the results of the two data evaluation methods in separate files. The results of the data evaluation with the method described in Appendix 5 shall be reported according to Tables 4, 5 and 6. The results of the data evaluation with the method described in Appendix 6 shall be reported according to Tables 7, 8 and 9. The header of the data reporting file shall be composed of three parts. The first 95 lines shall be reserved for specific information about the settings of the data evaluation method. Lines 101-195 shall report the results of the data evaluation method. Lines 201-490 shall be reserved for reporting the final emission results. Line 501 and all consecutive data lines comprise the body of the data reporting file and shall contain the detailed results of the data evaluation.